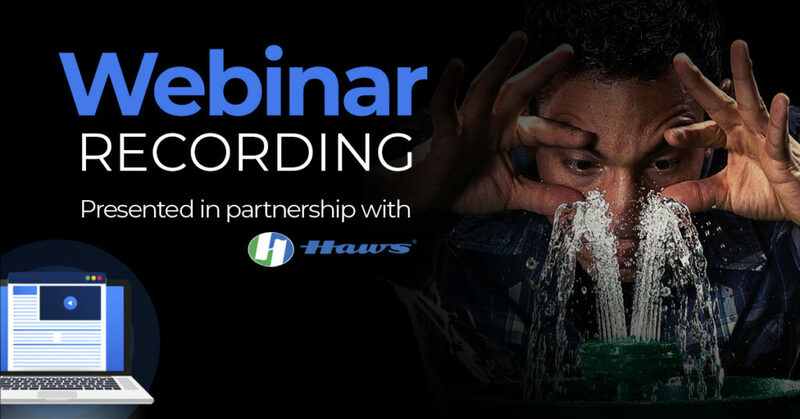 Yesterday we hosted a live webinar in partnership with Haws on everything you need to know about the ANSI Z358.1 standard for Emergency Showers and Eyewash. First, I’d like to thank the 400+ safety professionals who joined us for the live event! It was great to see so much engagement. A special thanks to Justin Dunn, Sales Product Specialist and Trainer at Haws, for leading this webinar and explaining the importance of the ANSI standard and what exactly that means for us who work in the industry. We covered everything from compliance to equipment and also had the chance to answer some great questions which are listed below. In case you didn’t have the chance to join us, you can view the recording here. If you’d just like a rundown on what you missed instead, keep reading! What is the ANSI Z358.1 standard? Written by the International Safety Equipment Association (ISEA), the ANSI standard (which we generally follow in Canada) defines emergency eyewash and shower design, location and temperature requirements for proper functionality and usage. OSHA references this ANSI standard as their expectation for compliancy. What are the significant requirements listed in ANSI Z358.1? Be accessible within 10 seconds (or 55 feet). Be located on the same level as the hazard. Be free of obstructions (anything that is in the way of a clear path from the hazard to the unit). Go from “off” to “on” in one second or less and remain on without the use of the operator’s hands. Deliver flushing fluid for a full 15 minutes. Note that some severely hazardous chemicals will not dilute to safe levels unless a longer flush is administered. Strong alkalis must be rinsed for 60 minutes and all other corrosives require 30 minutes of flushing. 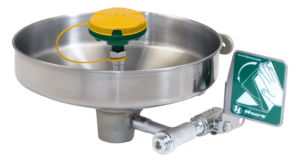 Provide a controlled flow of flushing fluid at a velocity low enough to be non-injurious to the user. If this seems overwhelming, be sure to take a look at our handy emergency shower and eyewash checklist. This resource will help walk you through your own inspection to ensure that you’ve got everything covered. What are the different types of units and how much water must they provide? Eyewash: used for wood shavings, dust and airborne particulates – must provide 1.5 liters (0.4 gallons) of water per minute. Eye/Facewash: for minor incidents affecting only the eyes and face – must provide 11.4 liters (3 gallons) of water per minute. Drench shower: to rinse hazardous contamination from PPE – must provide 75.7 liters (20 gallons) of water per minute. Combination unit: features both an eye/facewash and shower unit to thoroughly wash chemical exposure to the face and entire body. All units which include both an emergency shower and eye/face wash station must be capable of operating simultaneously. This includes maintaining sufficient pressure and volume to the eyewash or eye/face wash and shower when both are activated together. In addition, they must be positioned in a way which allows an individual to use them together at one time. This ensures that a person can access water on both their body and face. Every emergency shower and/or eyewash unit must have clear and highly-visible signage to help employees easily locate it in the case of an emergency. All nozzles, outlets and stored flushing must be protected against airborne contaminants with dust covers. All emergency shower and eye/facewash units must deliver tepid flushing fluid between 16°C – 38°C (60°F – 100°F). 75 per cent of ophthalmologists agree that having tempered water is essential, citing that it increases the chances that a victim can tolerate the required 15-minute flushing after a dangerous exposure. If water is too cold, it can lead to cold shock and even cardiac arrest. Thermostatic mixing valves can help regulate your water to the appropriate temperature. All employees who may be exposed to hazardous materials shall be instructed on the location and proper use of emergency showers. All emergency washing equipment must be activated weekly for amount of time long enough to ensure that all stagnant water is flushed from the unit. This is key in having each emergency unit prepared for when it’s needed. 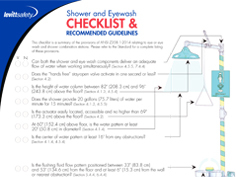 In addition to weekly checks, all emergency shower and eye/face washes must be fully inspected annually to ensure conformance with the installation section of the Z358.1 standard for that type of equipment. Learn more about our no-charge, third-party reviews here. Q: Does ANSI Z358.1 apply to Canada? A: Though the Standard is American, a number provinces including Alberta, Manitoba, New Brunswick, Newfoundland , Nova Scotia, Prince Edward Island and Saskatchewan reference it in their provincial safety regulations. This standard is generally recognized as the best model available for Canadians to look to when assessing their emergency shower and eyewash equipment. 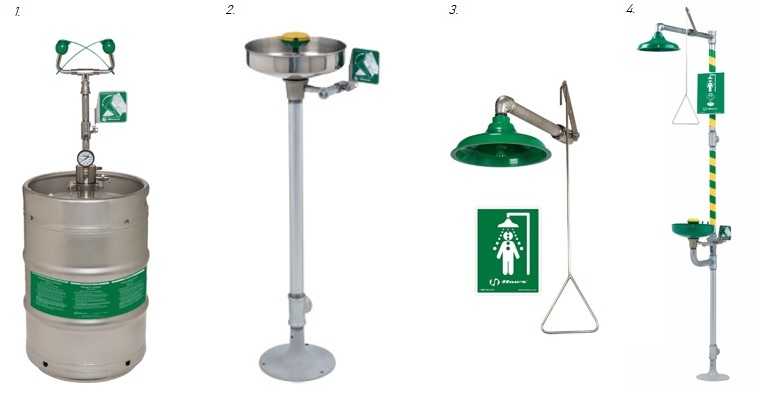 Q: When do you need an emergency shower vs. an eyewash station? A: Eye/facewashes are best for situations which deal with only particulates or very low pH chemicals that will only affect the soft tissue of your eyes. Any time you are dealing with a corrosive or skin irritant, a shower must be used. Showers help decontaminate PPE and provide relief for victims who come in contact with a hazardous material on their body. Be sure to check your SDS sheets for more information on the materials you’re working with. Q: With the ANSI update, are existing eye/facewashes, showers and drench-hose stations also required to meet the new guidelines? A: Unlike other safety standards, there is no grandfather clause in place when it comes to emergency shower and eyewash equipment. This means that every unit, regardless of when it was purchased, must follow the newest edition of the ANSI standard. However, it’s worth noting that we offer upgrade kits which can help bring yours up to code. Q: What changes do you foresee in the next update to the standard? A: Justin Dunn predicts that in the future the standard will narrow down the definition of “tepid water”. At present, the Standard calls for 16°C – 38°C (60°F – 100°F), but 16°C can still feel quite cold. He believes it’s likely that ANSI will require this temperature to be raised to provide a more comfortable washing solution. Other changes that could be coming may concern drainage (as the Standard does not mention it presently) and improving the water range required for eye/facewash heads, narrowing the flow for a more precise delivery of relief. Q: How do you prevent corrosion in water lines? A: The best way to avoid corrosion is by activating your units every week. This part of the mandatory weekly checks helps clean out dead legs and ensures that the water in your pipes are not given the opportunity to grow bacteria. This will also help prevent corrosion. A thorough check for proper installation and activation to assess equipment performance requirements against the standard. A detailed report that includes an executive summary of the current state of the equipment. An inspection report for each asset that identifies and documents compliance gaps, potential root causes AND recommendations. If you’re ready to get started, request your review today! There is no obligation to buy anything; just an unbiased, third-party review to make sure that your existing equipment is ready when it’s needed.